Ranjit started working with UGPTI's Small Urban and Rural Transit Center in December 2012. His research areas include demand response transit and paratransit services, transit in small urban and rural communities, transit's contribution towards rural livability, bike sharing, roundabout studies, traffic control devices, transportation and highway safety, pedestrian studies, low volume road safety, and freight transportation. 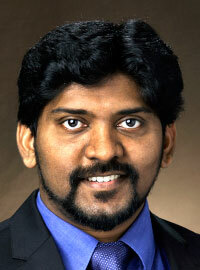 Ranjit received his Ph.D. degree in Transportation Engineering from Kansas State University. He has received his B.S. degree in Civil Engineering from Nagarjuna University (Andhra Pradesh, India) and M.S. degree in Transportation Engineering from Kansas State University. Bike share program in small urban communities – livability benefits and mode share impacts. Winter bike sharing in United States – User willingness, and operator's challenges and best practices. Exploring Transit's Contribution to Livability in Rural Communities: Case Study of the North Dakota Cities of Valley City and Dickinson.